Draft: 2009, Colorado Rockies, 2nd rd. Nolan James Arenado … son of Fernando and Millie … has two brothers, Jonah and Cousey … resides in San Clemente, Calif., during the offseason ... He is of Cuban (father) and Puerto Rican (mother) descent … visited Cuba for the first time with his family after the 2016 season ... Brother of Jonah Arenado, a third baseman in the Giants organization, and cousin of Josh Fuentes, a third baseman in the Rockies organization ... Some of his favorite musicians include Kings of Leon, Travis Scott and Post Malone … enjoys playing golf and Wiffle Ball, and playing his DJ kit in his free time ... Attended El Toro High School in Lake Forest, Calif., where he played shortstop and catcher ... Played with fellow Major Leaguers Matt Chapman (Oakland) and Austin Romine (New York-AL) at El Toro ... Had his high school number retired in Feb. 2014 ... Committed to Arizona State University … was rated the 17th best catcher available in the draft by Baseball America, although he was drafted as an infielder. Led the National League with 38 home runs in 2018, the third time in his career he has led or tied for the league lead in home runs, the first time he has won the home run crown outright ... Started at third base in all four postseason games … went 3-for-16 (.188) with two RBI ... Fourth consecutive season with at least 30 home runs and 100 RBI, the fourth Rockies player with four such seasons (also: Todd Helton, Vinny Castilla and Larry Walker) and the third with four consecutive years (also:Castilla and Helton) ... Fourth consecutive season with at least 75 extra-base hits, the second third baseman in MLB history to have four such seasons (Chipper Jones), the first to do it in four-straight seasons … the second Rockies player to have four such seasons (Todd Helton, 1999-2004) ... An All-Star for the fourth consecutive season and voted in by the fans as starter for the second straight year ... Led the National League with 38 home runs, the third time in his career he has led or tied for the league lead in home runs, the first time he has won the home run crown outright … 12th player in National League history to lead the league in home runs three or more times, the first since Mike Schmidt ... Is the second player in Major League history to record at least 35 home runs and 35 doubles in four consecutive seasons (also: Albert Belle, 1993-96) ... In addition to home runs, was among National League leaders in multi-hit games (57, 1st), RBI (110, T2), slugging percentage (.561, 3rd), extra-base hits (78, T3), runs (104, 5th), doubles (38, T8) and batting average (.297, 10th) … per Baseball Reference, ranked fifth among NL position players with 5.6 WAR ... Led the NL with 15 home runs and .747 slugging percentage vs. left-handed pitching … his .368 average vs. lefthanders ranked second in the league ... Slashed .347/.424/.681 with 23 home runs at Coors Field … ranked first in NL in home batting average, second in home runs ... Ranked third in the NL with 30 go-ahead RBI, including a league-leading 19 on the road … his 139 go-ahead RBI since 2014 are tied for the most in the Majors ... Hit .317 (44-for-139) with runners in scoring position, which ranked 12th in the NL … his .333 career batting average with RISP ranks third among active MLB players ... His 13 game-winning RBI were tied for the most in the NL … his 82 game-winning RBI since 2014 are the most in MLB ... Recorded three multi-home run games (May 2 at Chicago-NL, July 20 at Arizona, Sept. 30 vs. Washington) … his 15 career multi-home run games are the sixth-most in franchise history ... Named the NL Player of the Week for June 18-24 … Led NL third basemen with 430 total chances, 104 putouts, 312 assists and 44 doubles plays … second with a .967 fielding percentage. Set career highs in hits (187), triples (seven), batting average (.309), on-base percentage (.373) and slugging percentage (.586), while winning his fifth consecutive Gold Glove Award and his third consecutive Silver Slugger Award...Tied with Adrian Beltre for the most Gold Gloves among active players at his position and is the first NL third baseman to take five straight since Scott Rolen (2000-04) … only Ichiro Suzuki began his career with more consecutive Gold Glove Awards (2001-10) … Arenado's five Gold Gloves are tied with outfielder Larry Walker for the Rockies club record...Hit 19 home runs at Coors Field, 18 on the road...Ranked among NL leaders in doubles (T1st), RBI (2nd), home runs (T3rd), hits (6th), runs (T7th), triples (T5th), batting average (8th), slugging percentage (4th), extra-base hits (2nd) and total bases (3rd) … per Baseball Reference, finished third among NL position players with a 7.2 WAR...Made his first career postseason appearance in the National League Wild Card Game and went 1-for-5 with a solo home run...Voted by fans as an All-Star starter for the first time and went 2-for-2 … became the first Rockies player in franchise history to record multiple hits in an All-Star Game...Finished second in MLB, first in the NL, with a .420 batting average (63-for-150) against left-handed pitchers … his 16 home runs off left-handed pitching were the most in the Majors and the most by a Rockies player in franchise history...Third in MLB, second in the NL, with a .385 average (60-for-156) with runners in scoring position … led MLB with a .801 slugging percentage with RISP, the second-highest in franchise history with RISP (Andres Galarraga, .810 in 1996) and the highest in MLB since Albert Pujols slugged .802 with runners in scoring position in 2006...Led MLB with 22 game-winning RBI … recorded three walk-off RBI, tied for the Rockies single-season franchise record (also: Dante Bichette in 1996, Jeff Cirillo in 2001) … his seven career walk-off RBI are tied for the third-most in franchise history with Brad Hawpe (most: Todd Helton and Dante Bichette, nine)...Hit an MLB-leading .413 (57-for-138) in the first inning (min. 75 PA) with 11 doubles, one triple, 10 home runs, 31 RBI and eight walks...Named the NL Player of the Month for July … finished the month first in RBI (30), second in batting average (.389), tied for third in home runs (eight) and fourth in hits (35)...Career-high five hits and career-high three home runs on July 19 vs. San Diego … tied his career high in runs (four) and RBI (seven) … the 12th Rockies player (16th time) to have a three-home run game … his 14 total bases tied a franchise record (also: Larry Walker, 2004 and Jeff Cirillo, 2000)...Hit a walk-off home run to complete the cycle on Father's Day, June 18 vs. San Francisco … became the fifth player in Major League history to complete the cycle with a walk-off home run (last: Carlos González, July 31, 2010 vs. Chicago-NL) … it was the first walk-off home run to complete the cycle with the batter's team trailing in Major League history … eighth player in franchise history to complete the cycle, the first since Michael Cuddyer on Aug. 17, 2014 vs. Cincinnati...Led all third basemen with 20 defensive runs saved … led NL third basemen in total chances (423), assists (311) and double plays (39) … ranked second in fielding percentage (.979). Selected to the All-Star Game and won the Silver Slugger for the second consecutive season en route to capturing his fourth consecutive Gold Glove...For the second consecutive year, tied for National League home run lead and led the Majors in RBI...Finished the season tied for the NL lead with 41 home runs and led the Major Leagues with 133 RBI … was the first NL player since Mike Schmidt in 1980-81 to lead the league in home runs and RBI in consecutive seasons...Became the third player in MLB history to have consecutive 40-home run, 130-RBI seasons before turning 26, joining Chuck Klein and Jimmie Foxx...Became the third Rockies player to have multiple seasons of 40 or more home runs and 130 or more RBI, joining Andres Galarraga (1996-97) and Todd Helton (2000-01)...Joined Miguel Cabrera (2012-13) and Alex Rodriguez (2005, 2007) as the only players whose primary position was third base to have multiple 40-130 seasons...His 133 RBI were tied for the ninth-most for a single season in franchise history, the most since Matt Holliday recorded 137 RBI in 2007 … his 41 homers tied for the seventh-most in club annals...According to Elias, the second player in the last 75 years to produce 125 or more RBI in consecutive seasons at age 25 or younger (Pujols, 2001-02)...Finished first in the NL in total bases (352), second in runs (116), second in extra-base hits (82), second in slugging percentage (.570), seventh in hits (182) and tied for second with 57 multi-hit games...Hit .356 (53-for-149) with runners in scoring position, the fourth-highest average in the National League...Played in 160 games, the most by a Rockies player since 2003 (Todd Helton) … is only the fifth player in franchise history to play in 160 or more games...Fourth grand slam of his career Sept. 21 vs. St. Louis … one grand slam in each of his first four seasons in MLB...Recorded five multi-home run games...Hit .356 (37-for-104) in August with 10 home runs and a Major League-leading 36 RBI, tied for the third-most in a month in franchise history, the most ever in the month of August...Hit his 30th home run of the season, the 100th of his career, Aug. 8 vs. Texas (Hamels)...Per Elias, the first NL player since Carlos Lee (2007-08) to reach the 100-RBI mark first in consecutive seasons...Went 4-for-5 with two home runs and a career-high seven RBI April 13 vs. San Francisco … his 10 RBI in the series the most by a Rockie in any three-game series since 2010 (Troy Tulowitzki vs. San Diego)...Recorded 24 RBI vs. the Giants for the second straight season … the only other Rockies player to record 24 RBI in a season vs. any opponent was Preston Wilson vs. San Francisco in 2003...Was named National League Co-Player of the Week April 12-17 … in six games, batted .333 (9-for-27) and tied for the NL lead with four home runs and 12 RBI...Led all NL third baseman in total chances (490), assists (378), double plays (39) and defensive runs saved (20) … was third in putouts (99) and second in fielding percentage (.973). Was selected to his first career All-Star Game, won his first career Silver Slugger and won his third consecutive Gold Glove in his third Major League season. Finished the season with 42 home runs, tied for most in the National League and tied for third in MLB. Home runs tied for ffth-most for a single season in franchise history … one of eight players in Rockies history to hit 40 home runs (12th time overall) … frst to record at least 40 home runs since Todd Helton in 2001 (49). Led the NL with 22 road home runs and his 56 road RBI were tied for second … sixth player in franchise history to hit 20 home runs on the road, frst since Vinny Castilla in 2004 … 15th time in franchise history a Rockie has recorded 50 RBIs on the road, frst since Todd Helton in 2007. His 89 extra-base hits led MLB and were the most by a third baseman in MLB history. Led MLB with 130 RBIs, the most by a Rockies player since Matt Holliday drove in 137 in 2007 … was the fourth Rockies third baseman to reach the 100 RBI mark (Castilla 5x, Atkins 2x, Cirillo) … 130 RBI the third-most all-time by a Rockies third baseman. Led the Major Leagues with 56 hits with runners in scoring position while his .373 average was second. Named the September National League Player of the Month … led the Majors with 11 home runs and 32 RBIs while hitting .339 (38-for-112) with 19 runs scored and eight doubles in 28 games. Hit a go-ahead solo home run in the 16th inning Sept. 15 at Los Angeles-NL, the latest home run by inning in Rockies history. Hit home runs in a club-record six consecutive games Sept. 1-5 … it was the longest stretch since Chris Davis homered in six straight for Baltimore in 2012. Drove in a run in a career-high eight consecutive games Aug. 30-Sept. 5, the longest stretch by a Rockies player since Carlos Gonzalez' club-record 11-game RBI streak in 2011. From June 21-28, was 11-for-27 (.407) with eight home runs and 15 RBI, winning NL Player of the Week. Hit 10 home runs and recorded 24 RBI vs. San Francisco … per Elias Sports Bureau, he is the fourth player with that many home runs and RBI in a season vs. the Giants, joining Dolph Camilli in 1941 (11 HR, 30 RBI), Roy Campanella in 1953 (10, 28) and Stan Musial in 1954 (12, 27). Led all Major League third baseman in total chances (507), assists (385), double plays (42) and range factor per game (3.12) … led all NL third baseman in games (157), putouts (105) and zone rating (.811) en route to his third consecutive Gold Glove. Was a member of the Rockies' Opening Day roster for the first time in 2014 and set several career-highs despite playing fewer games in 2014 (111) than his rookie season of 2013 (133)...Set career-high totals in runs (58), doubles (34), home runs (18), RBI (61), walks (25), average (.287) and OPS (.828, .328 OBP, .500 SLG)...Named the NL winner of the Rawlings Gold Glove at third base for the second straight season...won the Gold Glove in 2013, becoming the second rookie third baseman to win the Award in NL history...Arenado is now the fifth player to have been awarded a Rawlings Gold Glove in each of their first two seasons: Frank Malzone (3B; 1957-59), Johnny Bench (C; 1968-77), Charles Johnson (C; 1995-98) and Ichiro Suzuki (OF; 2001-10). 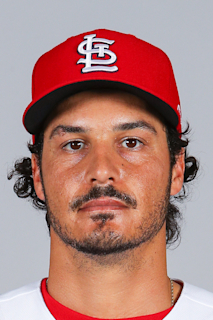 (Elias)...Was forced to miss 37 games from May 24-June 28 due to a fracture on his left mallet finger...was his first career DL stint...also missed time at the end of 2014 due to a chest contusion and early on-set pneumonia...Despite the time missed due to injury, Arenado finished third among NL third baseman in doubles (34) and tied for fourth in home runs (18)...Set a new franchise record when he hit safely in 28-straight games April 9-May 8...the streak was the longest in the Majors in 2014 and longest since Denard Span's 29-game streak in 2013...his 28-gamer lasted one game longer than Michael Cuddyer's previous club long of 27 games set in 2013...during the streak, Arenado batted .360 (40-for-111) with 11 doubles, four home runs, 20 RBI, 16 runs...Arenado's hit-streak is fifth-longest by a third baseman in the Divisional Era ('69)...Ryan Zimmerman (30 in '09), Wade Boggs (28 in '85), George Brett (30 in '80) and Pete Rose (44 in '78) are the other third baseman on that list...Named NL Player of the Week for the week of Aug. 18-24...hit .545 (12-for-22) with three doubles, one triple, two home runs, three RBI, six runs, 1.645 OPS...first POW honor...Had his first career multi-home run game on April 5 vs. Ariz., crushing both homers off Brandon McCarthy...Crushed his second-career grand slam off Jenrry Mejia on May 3 vs. New York-NL...One of the Rockies most clutch hitters since joining the club in 2013, Arenado batted .315 (23-for-73) with 10 doubles, four HR and 12 RBI in close and late situations in 2014...hit .299 (40-for-134) with 10 doubles, five home runs and 16 RBI in one-run games. Began 2013 season at Triple-A Colorado Springs before having his contract selected to Major League roster on 4/28...made MLB debut 4/28 at ARI...notched first MLB hit, HR and RBI (all off Josh Wall) in Rox 12-2 win 4/29 at LAD (3-for-6)... Despite not joining the Big League club until late April, led the club in games played (133) and ranked 2nd in doubles (29)... Ranked among the top five of Major League rookies in the following categories: hits (130, 1st), doubles (29, 1st), RBI (52, 4th), average (.267, 1st among qualifiers), extra-base hits (43, 2nd) and total bases (197, 3rd)... Crushed his first career grand slam in what was his second career home game on 5/4 vs. TB off David Price...had the Rockies lone walk-off home run in 2013, a solo shot on 6/7 vs. SD off Joe Thatcher... His 133 games are the 7th-most in franchise history for a rookie, and the 2nd-most by a rookie third baseman (Garrett Atkins 138 games in 2005)... Hit .298 (64-for-228) after the All-Star break, which included a .317 (32-for-101) batting average with 7 doubles in the month of August... Following the season was awarded wth a Rawlings Gold Glove at third base, becoming the first rookie in franchise history to win a Gold Glove and just the second rookie third baseman in Major League history (Frank Malzone in 1957)... Arenado is the 10th Rookie in Major League history to be awarded a Rawlings Gold Glove since the award's inception in 1957, joining Malzone (1957 3B), Ken Hubbs (1962 2B), Tommie Agee (1966 OF), Johnny Bench (1968 C), Carlton Fisk (1972 C), Fred Lynn (1975 OF), Sandy Alomar Jr. (1990 C), Charles Johnson (1995 C) and Ichiro Suzuki (2001 OF)... He became the first Rockies third baseman to ever be awarded a Gold Glove... Finished 4th in the NL among third baseman in fielding percentage (.973)...his 411 total chances were the 2nd-most in the NL behind only Pedro Alvarez (458), who played 218.1 more innings than Arenado...led NL 3B in total chances per 9.0 ip (3.33)...was T-2 among NL 3B in double plays with 27. Was a member of the Double-A Tulsa Drillers roster for entire 2012 season...led the Drillers in games (134), at bats (516), hits (147), doubles (36) and RBI (56) in his first experience at Double-A...named to the Texas League Mid-Season All-Star team in 2012...hit .293 (83-for-283) with 17 doubles, 7 home runs and 38 RBI prior to the All-Star break...has at least 30 doubles in all three of his full professional seasons...his 36 doubles were tied for 2nd in the Texas League in 2012...has 124 doubles in his first four professional seasons...went 1-for-3 with a run in his first career Futures Game appearance at Kauffman Stadium in Kansas City...2011: Spent the entire season at High-A Modesto where he batted .298 (154-for-517) with 32 doubles, 3 triples, 20 home runs, 122 RBI and 82 runs in 134 games for the Nuts...led all of Minor League Baseball in RBI and set a new Rockies Minor League record with his 122 RBI in 2011...was a California League Post-Season All-Star and played in his first Futures Game in 2011...batted .311 (56-for-180) with 105 RBI with runnersin scoring position...also batted .338 with RISP and 2 outs...finished the 2011 season with the Salt River Rafters in the Arizona Fall League...was named the circuit's MVP after batting .388 (47-for-121) with 12 doubles, 6 home runs and 33 RBI in 29 games for the league champion Rafters...was also named to the AFL All-Prospect Team and selected to play in the AFL Rising Stars game...MLB.com named Arenado its 22nd overall prospect, top third base prospect and the top Rockies prospect heading into the 2012 season. Spent the entire season at High-A Modesto where he batted .298 (154-for-517) with 32 doubles, 3 triples, 20 home runs, 122 RBI and 82 runs in 134 games for the Nuts...Led all of Minor League Baseball in RBI and set a new Rockies Minor League record with his 122 RBI in 2011...Was a California League Post-Season All-Star and played in his first Futures Game in 2011...Batted .311 (56-for-180) with 105 RBI with runners in scoring position...also batted .338 with RISP and 2 outs...Finished the 2011 season with the Salt River Rafters in the Arizona Fall League...was named the circuit's MVP after batting .388 (47-for-121) with 12 doubles, 6 home runs and 33 RBI in 29 games for the league champion Rafters...Was also named to the AFL All-Prospect Team and selected to play in the AFL Rising Stars game...MLB.com named Arenado its 22nd overall prospect, top third base prospect and the top Rockies prospect heading into the 2012 season. Spent his second professional season with Low-A Asheville as the everyday third baseman...set career highs in nearly every offensive category including hitting 10 more home runs than in 2009 (12 compared to 2)...among qualified Tourists he led the team in average and doubles, also had the second-most home runs on the team...his .308 average was fifth-highest in the South Atlantic League while his 41 doubles were second-most and his .520 slugging percentage was third-highest in the SAL...was named the third-best prospect in the Rockies system by Baseball America prior to the 2011 season...also named the best hitter for average and best infield arm in the Rockies system by Baseball America. Spent his initial professional season with Rookie Level Casper in the Pioneer League as the club's regular third baseman...hit .300 (61-for-203) with 15 doubles, 2 triples and 22 RBI for the Ghosts...drew nearly as many walks (16) as he had strikeouts (18)...was named as the eighth-best prospect in the Pioneer League by Baseball America following the season...was also named the 10th-best prospect in the Rockies organization and as the best hitter for average in the Rockies system by Baseball America. April 19, 2018 Colorado Rockies activated 3B Nolan Arenado. April 14, 2018 3B Nolan Arenado roster status changed by Colorado Rockies. October 30, 2014 3B Nolan Arenado assigned to Cangrejeros de Santurce. October 30, 2014 Cangrejeros de Santurce placed 3B Nolan Arenado on the reserve list. July 3, 2014 Colorado Rockies activated 3B Nolan Arenado from the 15-day disabled list. June 28, 2014 Colorado Rockies sent 3B Nolan Arenado on a rehab assignment to Colorado Springs Sky Sox. April 28, 2013 Colorado Rockies selected the contract of 3B Nolan Arenado from Colorado Springs Sky Sox. April 3, 2013 Nolan Arenado assigned to Colorado Springs Sky Sox from Tulsa Drillers. February 5, 2013 Colorado Rockies invited non-roster 3B Nolan Arenado to spring training. March 30, 2012 Nolan Arenado assigned to Tulsa Drillers from Modesto Nuts. February 2, 2012 Colorado Rockies invited non-roster 3B Nolan Arenado to spring training. April 5, 2011 Nolan Arenado assigned to Modesto Nuts from Asheville Tourists. March 13, 2011 3B Nolan Arenado assigned to Colorado Rockies. May 21, 2010 Nolan Arenado assigned to Asheville Tourists from Casper Ghosts. July 12, 2009 Nolan Arenado assigned to Casper Ghosts. July 6, 2009 Colorado Rockies signed SS Nolan Arenado.